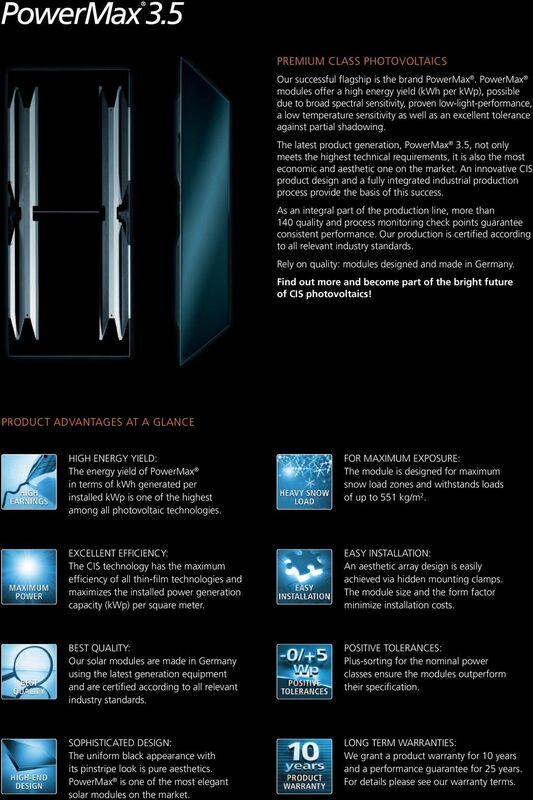 2 PREMIUM CLASS PHOTOVOLTAICS Our successful flagship is the brand PowerMax. PowerMax modules offer a high energy yield (kwh per kwp), possible due to broad spectral sensitivity, proven low-light-performance, a low temperature sensitivity as well as an excellent tolerance against partial shadowing. The latest product generation,, not only meets the highest technical requirements, it is also the most economic and aesthetic one on the market. An innovative CIS product design and a fully integrated industrial production process provide the basis of this success. As an integral part of the production line, more than 140 quality and process monitoring check points guarantee consistent performance. Our production is certified according to all relevant industry standards. Rely on quality: modules designed and made in Germany. Find out more and become part of the bright future of CIS photovoltaics! PRODUCT ADVANTAGES AT A GLANCE HIGH ENERGY YIELD: The energy yield of PowerMax in terms of kwh generated per installed kwp is one of the highest among all photovoltaic technologies. FOR MAXIMUM EXPOSURE: The module is designed for maximum snow load zones and withstands loads of up to 551 kg/m 2. 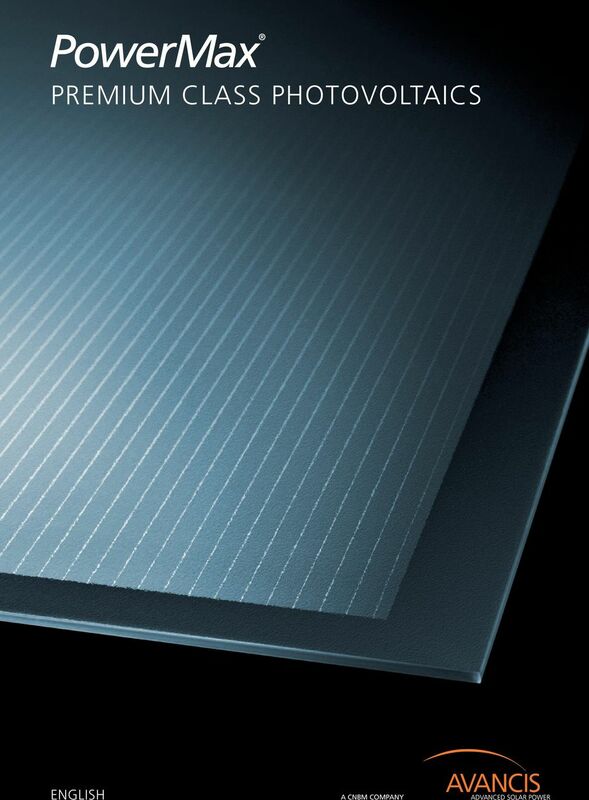 EXCELLENT EFFICIENCY: The CIS technology has the maximum efficiency of all thin-film technologies and maximizes the installed power generation capacity (kwp) per square meter. EASY INSTALLATION: An aesthetic array design is easily achieved via hidden mounting clamps. The module size and the form factor minimize installation costs. BEST QUALITY: Our solar modules are made in Germany using the latest generation equipment and are certified according to all relevant industry standards. POSITIVE TOLERANCES: Plus-sorting for the nominal power classes ensure the modules outperform their specification. SOPHISTICATED DESIGN: The uniform black appearance with its pinstripe look is pure aesthetics. 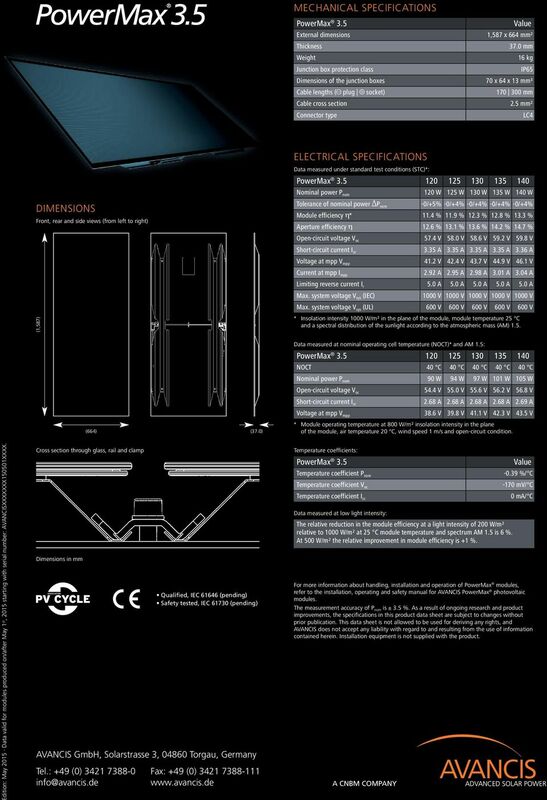 PowerMax is one of the most elegant solar modules on the market. LONG TERM WARRANTIES: We grant a product warranty for 10 years and a performance guarantee for 25 years. For details please see our warranty terms. 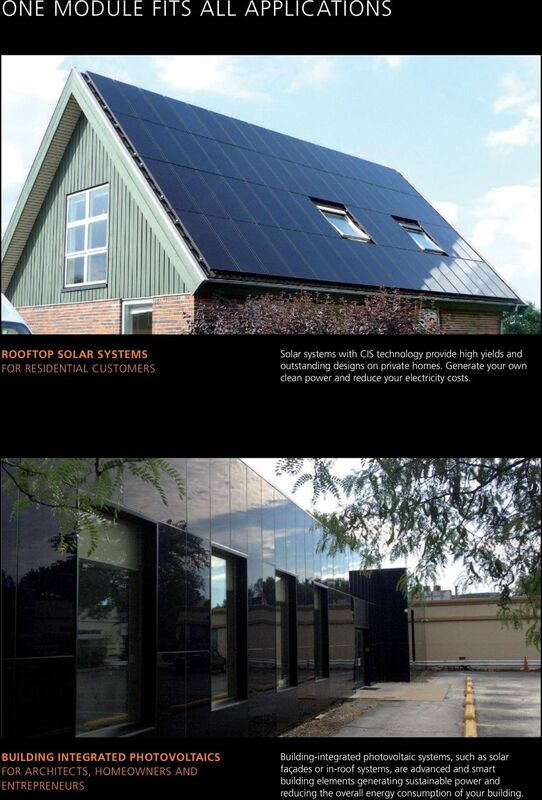 3 ONE MODULE FITS ALL APPLICATIONS ROOFTOP SOLAR SYSTEMS FOR RESIDENTIAL CUSTOMERS Solar systems with CIS technology provide high yields and outstanding designs on private homes. Generate your own clean power and reduce your electricity costs. BUILDING INTEGRATED PHOTOVOLTAICS FOR ARCHITECTS, HOMEOWNERS AND ENTREPRENEURS Building-integrated photovoltaic systems, such as solar façades or in-roof systems, are advanced and smart building elements generating sustainable power and reducing the overall energy consumption of your building. 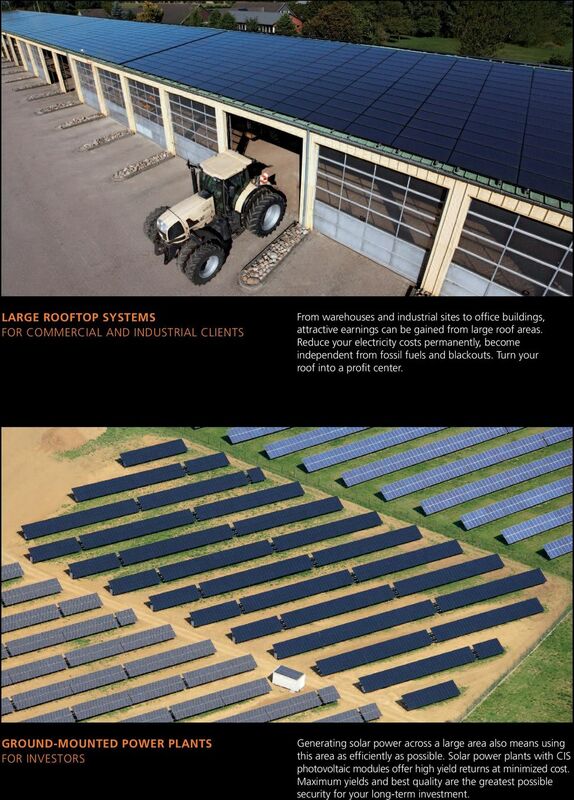 4 LARGE ROOFTOP SYSTEMS FOR COMMERCIAL AND INDUSTRIAL CLIENTS From warehouses and industrial sites to office buildings, attractive earnings can be gained from large roof areas. Reduce your electricity costs permanently, become independent from fossil fuels and blackouts. Turn your roof into a profit center. GROUND-MOUNTED POWER PLANTS FOR INVESTORS Generating solar power across a large area also means using this area as efficiently as possible. 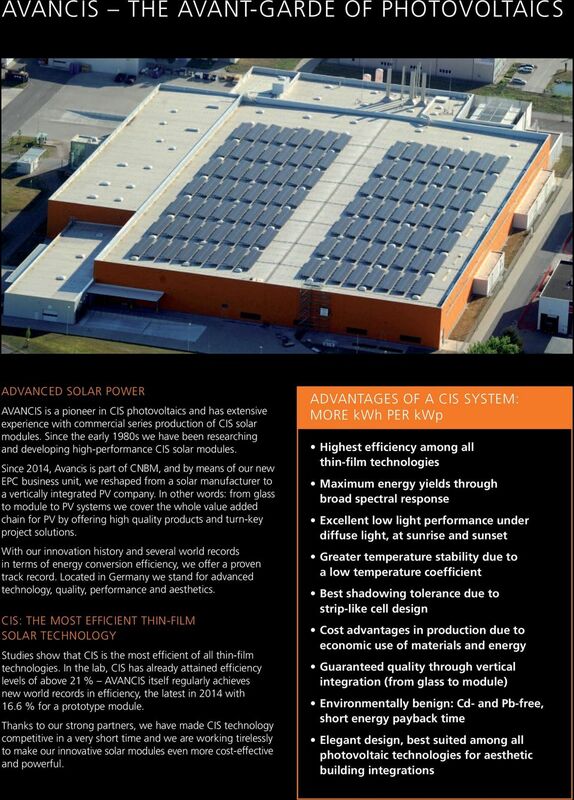 Solar power plants with CIS photovoltaic modules offer high yield returns at minimized cost. Maximum yields and best quality are the greatest possible security for your long-term investment. DATA SHEET. BZV49 series Voltage regulator diodes DISCRETE SEMICONDUCTORS. Product data sheet Supersedes data of 1999 May 11. DISCRETE SEMICONDUCTORS DATA SHEET book, halfpage M3D109 Supersedes data of 1999 May 11 2005 Feb 03 FEATURES Total power dissipation: max. 1 W Tolerance series: approx. ±5% Working voltage range: nom.